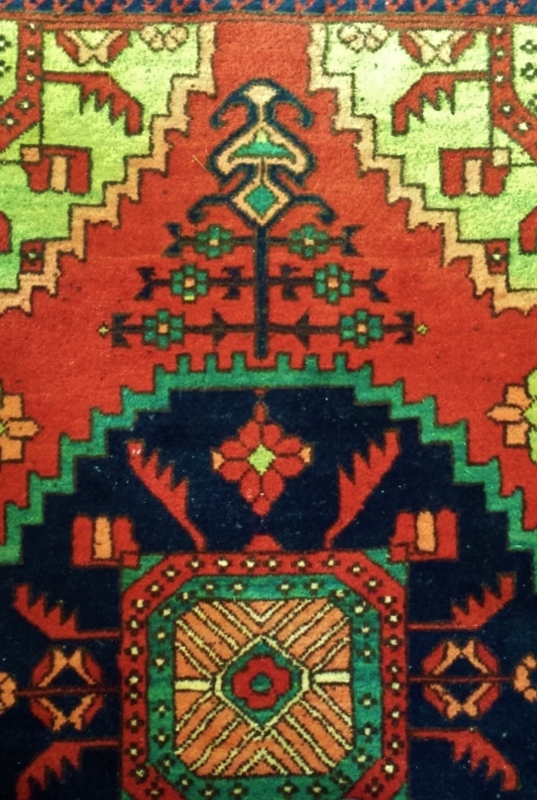 Tekke Turkomen rug, detail. Private collection. As collectors themselves, Daphne Mason and her late husband stood out, in terms of the value they saw not only in “Fine Art” but also in the work of artisan makers across a wide range of media, cultures and eras. An antique oak Bible box and coffer sat comfortably in their home alongside tribal carvings and works by well-known contemporary international and New Zealand artists. It is this ability to value the skill and originality of creative expression, regardless of medium or primary function, that surfaces here in Daphne’s aptly named Persian Carpet Series of 1987. The title is as telling as the design and creation of these paintings themselves. 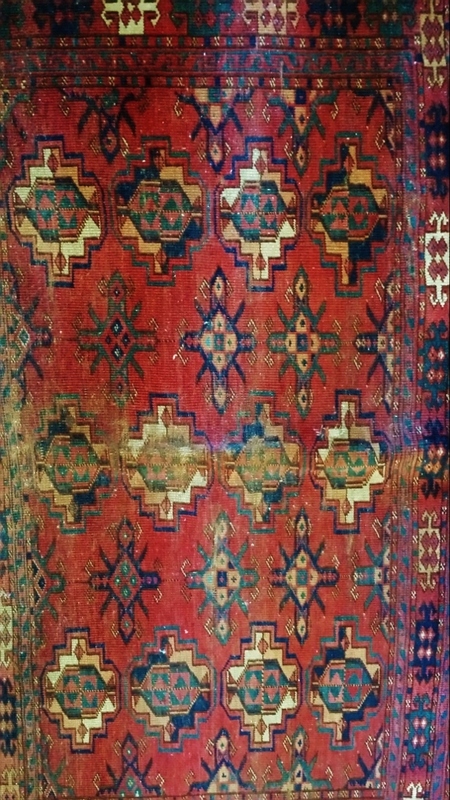 Although referencing a highly sought after form of artistic expression, the paintings owe as much to the Central Asian traditions of kilim weaving as do the more refined Persian carpets themselves. Both kilims (flatweave carpets without a pile) and Persian carpets are a fascinating mix of great skill and adherence to tradition, as well as an outlet for capturing the weaver’s everyday life. It seems as though early Persian carpets were largely symmetrical, with an emphasis on geometric designs framed perhaps by a border of Islamic calligraphy. As time went on, these designs became more organic, depicting animals or flowers, with tendrils and other embellishments requiring even greater skill from the weaver. It is thought that their increasing complexity is the result of their having been designed by miniature painters of the Persian Safavid dynasty (1501 – 1722). Although modern Western culture tends to differentiate sharply between what it terms “Fine Arts” and “handcrafts”, this would be viewed as an artificial construct in many cultures, even today, where the best artists might also be used as designers across a wide range of media (as in the Western world’s own Italian Renaissance). 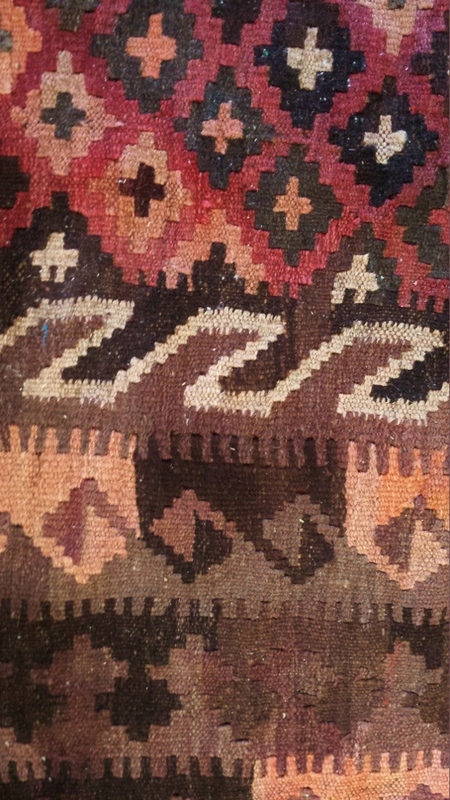 Modern Afghan Kilim, detail. Almar or Maimana provenance? 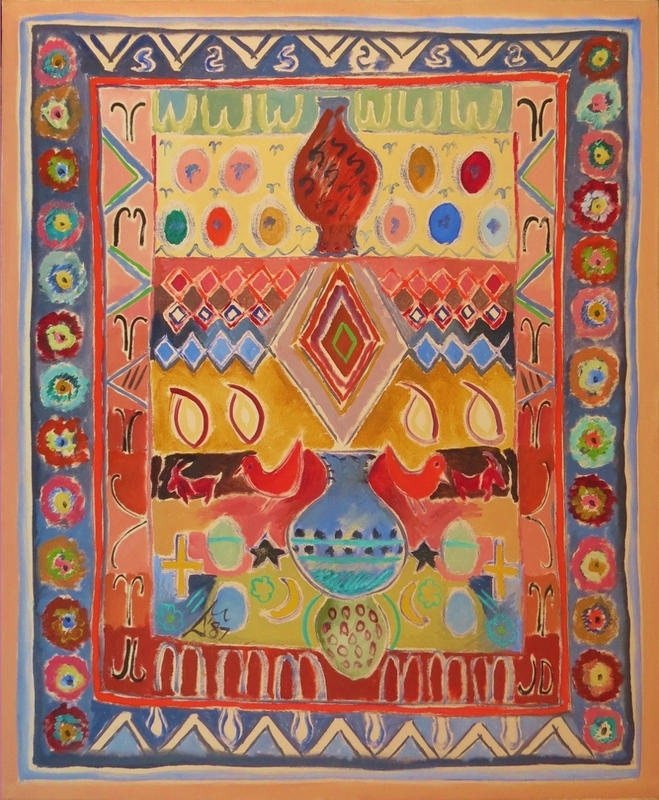 Where kilim weaving becomes of particular interest in the context of this series of paintings, is that kilims tended traditionally to be the product of female weavers. Originally for personal use, the symbols they contain would reflect the tribal identity of the weaver, as well as traditions or symbols of special significance to her family. Their production also had to fit around other domestic responsibilities, being laid down until such other duties had been fulfilled. This well reflects the pattern Daphne herself had to follow during different seasons of her creative life, when the needs of her husband, children, extended family, friends or household required her focus and attention. While Persian carpets Daphne owned or had seen served as the initial inspiration for this series, along with the stories of their makers, the paintings evolved into something far more personal than this. 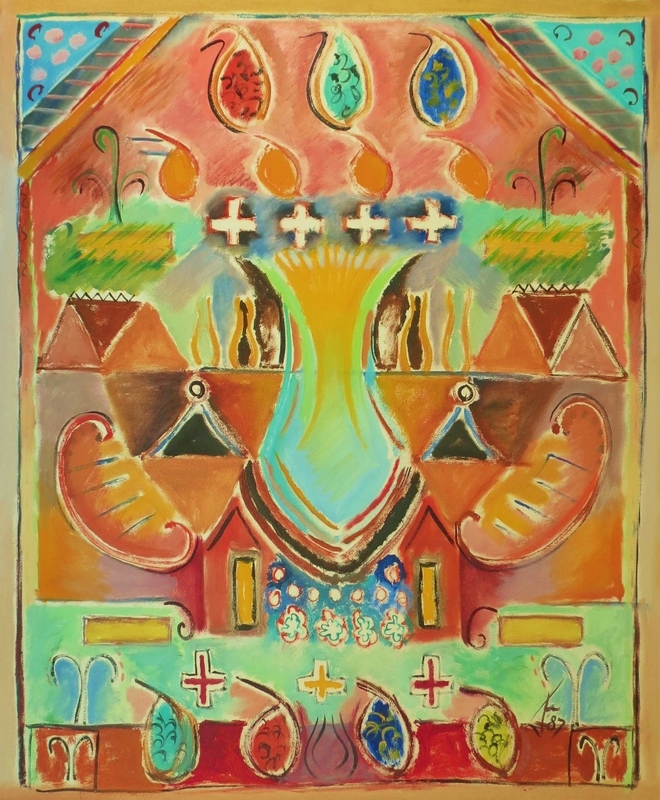 They became Daphne’s exploration of symbols from her own family story and immediate context, often soaked with saturated colour, yet still reflecting the ochres and rich red clay of the lifestyle block which was Daphne’s home at the time, and is once more today. Just like their forebears, the naive kilims and the sophisticated persian carpets of the title, Daphne’s works in this series span the full range of consciously naive imagery (Persian Carpet No.1) to the more meditative and complex imagery of Persian Carpet No.7. Images such as the goats, a happy nod to the injured goat kid Daphne raised many years before, also serve as reminders of a season in Daphne’s life when the menace of feral goats came closer to home, threatening her native bush. Fascinated by pattern, Daphne’s “M” (for Mason) undergoes a metamorphosis, becoming a repeat pattern reminiscent of horned symbols found in archaeological sites. Traditional boteh (paisley designs, symbol of fruitfulness) burst out of a neatly ordered ribbon-like border, escaping in a riot of colour. Strange bow-like shapes are transformed into plants whose seeds seem to cover the earth. 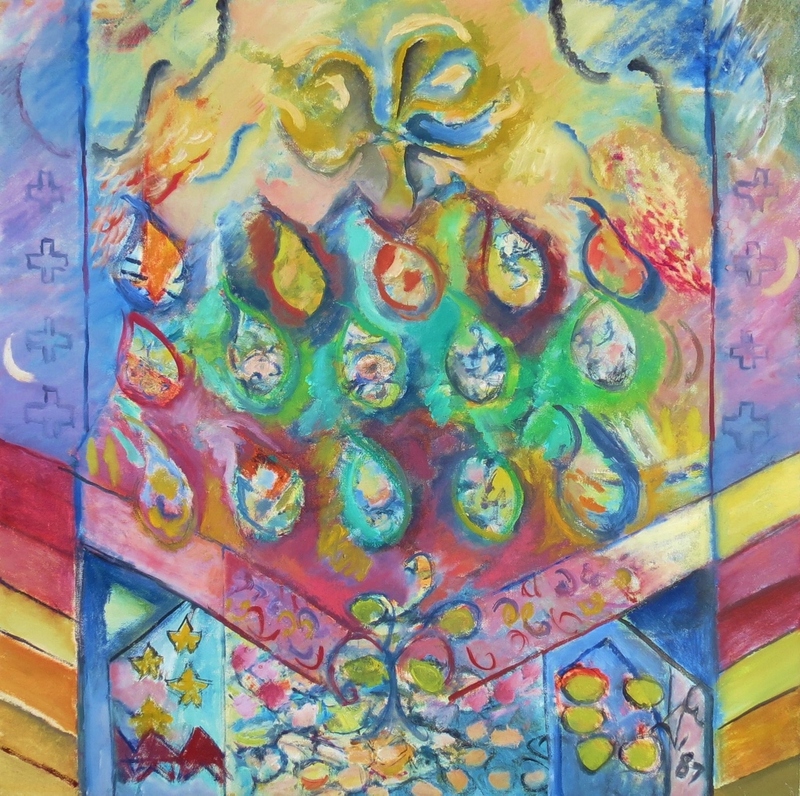 In most of the works stars, crosses, gul (traditional flower medallions), pomegranates or tulips, all add to the symmetry and balance; yet in this particular work they reinforce the sense that this is a wild and joyous celebration of escape from constraints. Persian Carpet No. 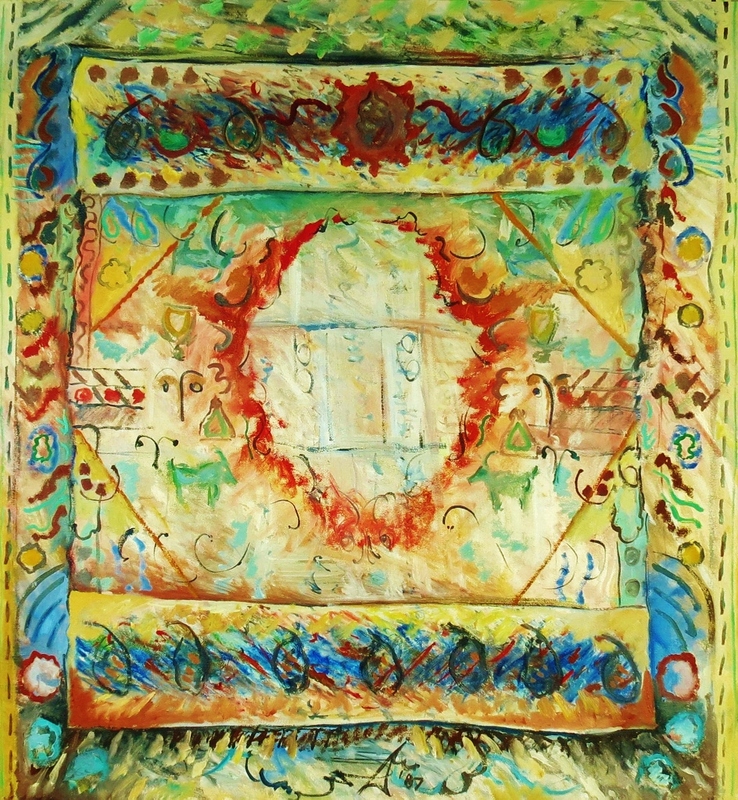 7 might be compared to a symphony, where the gul or medallion appears firmly embedded in the midst of the piece, like a recurring musical theme. Framed by “stitched” borders that firmly anchor the work’s many component parts, the painting has a weight and presence to it, like that of an orchestral work. Although the central gul is somewhat heraldic, any reference to lineage or legacy engages rather than distances the viewer, thanks to its overt or subliminally familiar imagery. In contrast, the gul of Persian Carpet No. 5 is an unabashed soloist, unashamedly bursting forth like a diva in a joyous celebration of life and colour. Here the borders, rather than containing and affirming any traditional rules of carpet composition, are instead framing and showcasing the liberated central theme, as if on a stage. Where Persian Carpet No. 7 seems like an in-depth study over time, this painting grabs the moment like the central pomegranate symbol, as though relishing every mouthful of its jewel-like contents with delight. Just as a composer might set him- or herself the challenge of creating contemporary works within the discipline of a traditional musical form, so Daphne has used The Persian Carpet Series to explore matters of balance and rhythm, symbolism, colour and form. 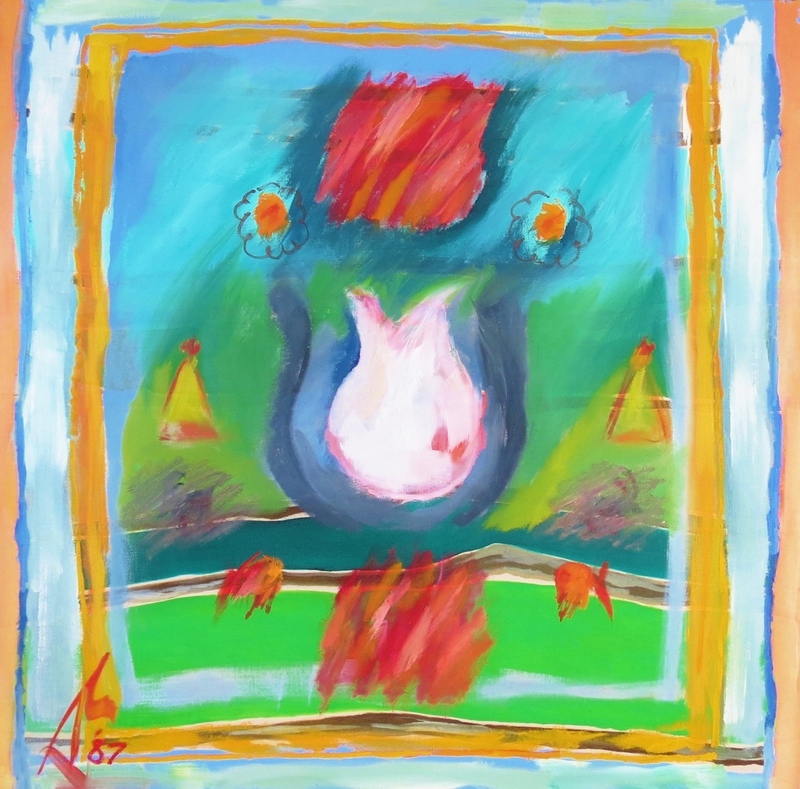 Whether using a naive or complex interaction with the canvas, the resulting series is full of gentle humour, colourful exchanges, and a gestural language and symbolism which will engage for years to come.